The Youngest One brought some homemade sausage from Vermont and that just says, “Grill, baby, grill”! Potato salad seemed like a good idea and since the grill was going anyway, why not grill the potatoes? And the onions, too? Turns out, that was my one good idea for the day!Libbey’s Meat Market on Route 114 in Lyndonville, Vermont is a small, family run meat market. They make their own sausages from a variety of meats. They also have great meat and will cut you whatever you want cut. In other words, these people know good products, use good products and they know what they are doing. So if you’re in the area, look them up. I don’t know if they will ship, but it might be worth a phone call. The sausage, Hunter’s Sausage, was delicious. It’s the kind of flavor that doesn’t need anything else, except maybe some grilled onions. As you know by now, The Goddess has a thing for herbs and spices. 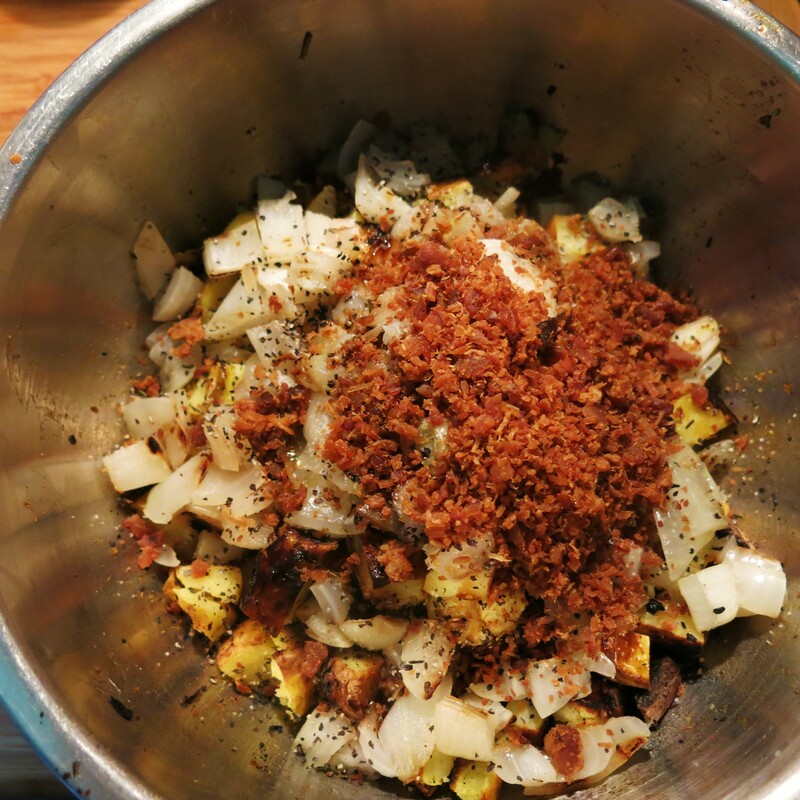 She tossed some on the raw potato slices, along with other good stuff, then off to the grill with the potatoes, and onions, too. This is after they were cooked and I diced them. I really do wish I’d taken a picture of them before, during and after grilling, but that ship sailed, didn’t it? Combine the herbs and spices. Toss the potatoes with the olive oil and spice blend coating the slices as evenly as possible. Place on a hot grill, along with the onion slices; lower the heat and cook, turning both once, until the potato slices are just tender and remove the onions while they still have some bite to them. Place the potatoes back in the bowl you used to coat them; let cool for at least 15 minutes or until you can handle them easily. 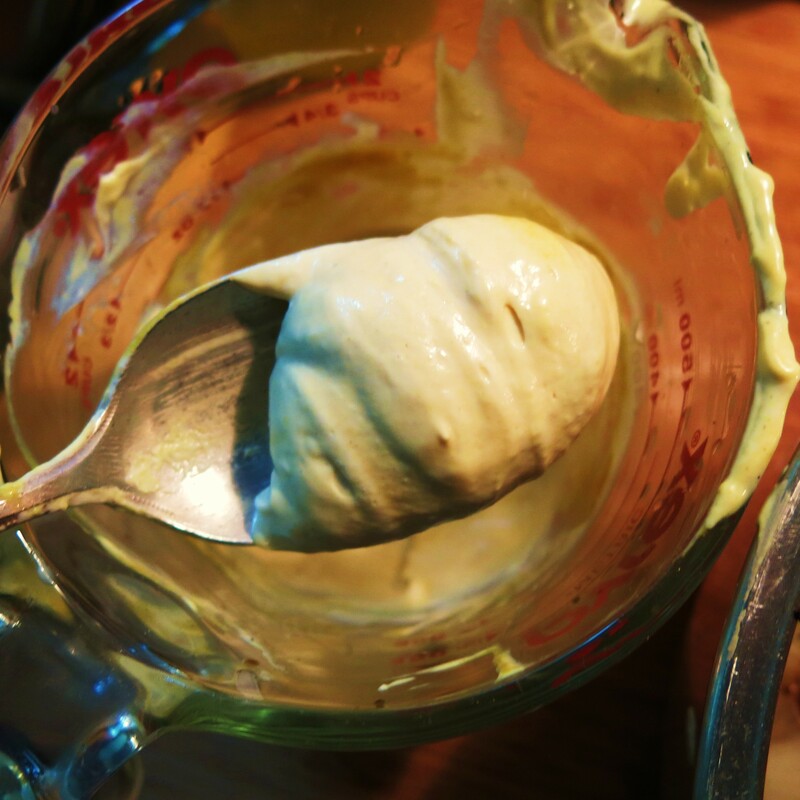 Meanwhile, combine the mayonnaise, yogurt, mustard, Worcestershire sauce and celery seed; set aside. Dice both the potatoes and onions. Add the bacon pieces and the diced dill pickles; toss to combine. Drizzle the good olive oil and balsamic vinegar over the vegetables. Sprinkle with salt and pepper. Pour the dressing over and toss until just combined. Serve immediately or at warm room temperature. Can be made ahead and reheated in the microwave until just nice and warm. Excellent served with pork, sausages or anything grilled. NOTE: You could add coarsely diced, cooked green beans to the mix. 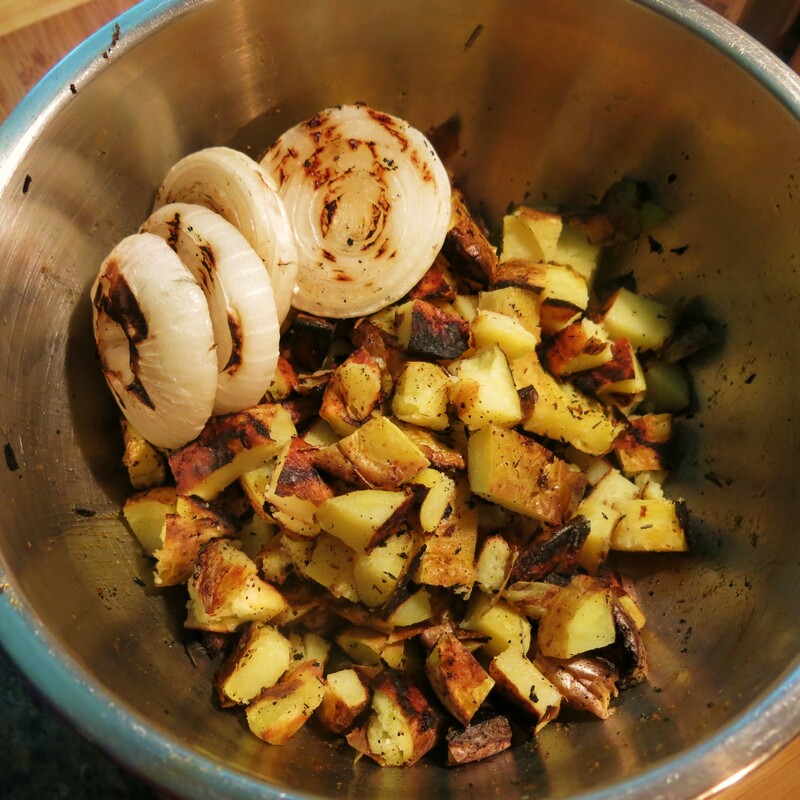 Grilled Potato Salad Recipe©Marcia Lahens 2015. All rights reserved. That’s it really. It sort of reminded me a bit of German potato salad. This was pretty mustard-y, so I gave you a range to use; I used the full 2 teaspoons. The bacon was some of the pre-cooked type that comes in bags. It’s good, but next time I would fry the bacon, as I like the crumbles a bit larger. The dill pickles were an after thought really, as I happened to see the jar in the fridge and there were about 8 slices in it. You know, these days I’m all about using up leftover things! But the dill pickles are definitely a keeper. I liked the old ballpark type mustard for this, but if you prefer grainy or Dijon, use that instead. I served this with those sausages, which were delicious. 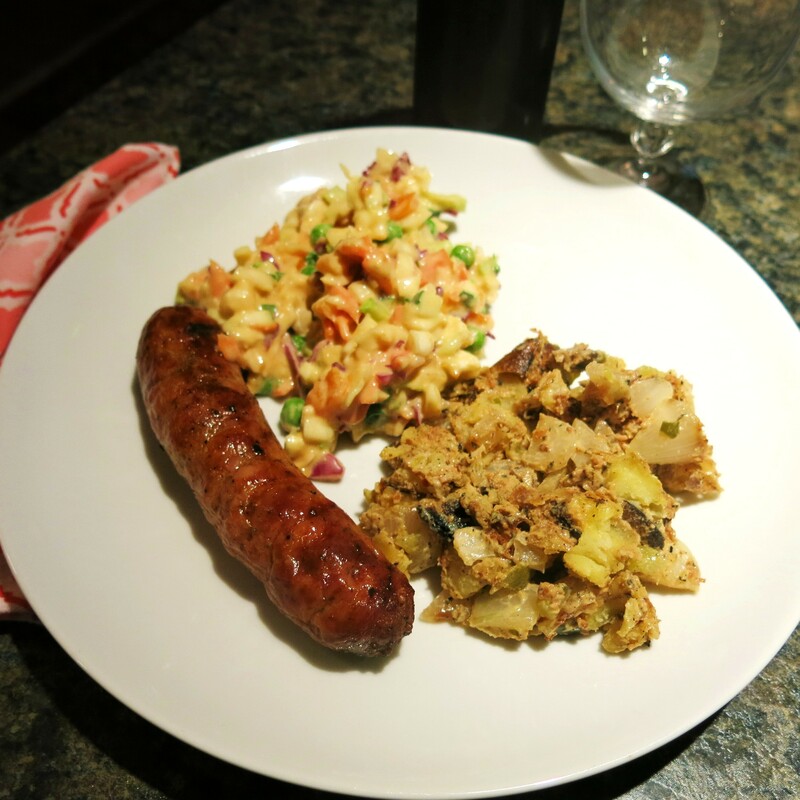 Usually I like mustard with pork sausage, but these were so well-balanced, I didn’t want to mess with the flavor. I also made the Sweet Mustard Summer Slaw that The Youngest One loves. I had a head of cauliflower, so I sliced it and grilled that, drizzled it with some truffle oil and a good sprinkle of Parmesan cheese. And that was dinner. Bring on the coffee, I’m a happy woman. The Latin Lover is flying in for the weekend…Life is good. Now, if we could just find a house, but that’s another story….Life is STILL good.